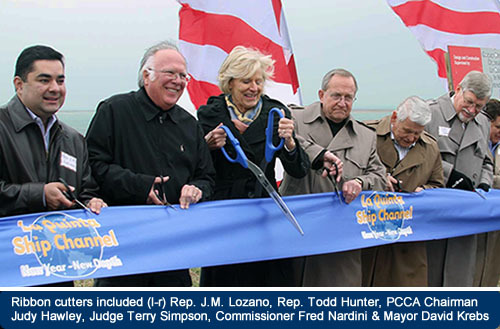 Despite the chill of an unusually cold February wind, spirits were high and new friendships were warm at the festive ribbon-cutting ceremonies marking the opening of the La Quinta Ship Channel extension and the new San Patricio Turning Basin. About 300 people joined in the celebration with leaders from San Patricio County communities, Port of Corpus Christi Authority commissioners, industry representatives and elected officials. 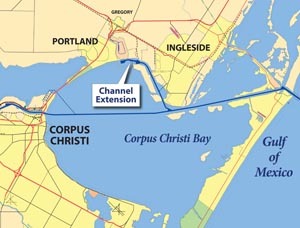 La Quinta Channel runs along the north shore of Corpus Christi Bay and is part of the federal deepwater ship channel system serving Bay Area marine terminals. Construction of the extension project by the Army Corps of Engineers has been underway since 2010, adding a total of 1.4 miles to the channel at a depth of 39 feet. Locally-funded dredging to deepen the extension and turning basin to a final operating depth of 45 feet is underway and will be complete by mid-year under a separate contract. This project is the first addition to the length of the Corpus Christi Ship Channel system since 1960 when the port’s Inner Harbor was extended two miles to its ultimate terminus at Viola Turning Basin. Judy Hawley, San Patricio County’s representative on the Port Commission and newly elected commission chairman, pointed to the steadfastness of community leadership that made it possible for the Port of Corpus Christi to add another vital piece to the nation’s infrastructure. 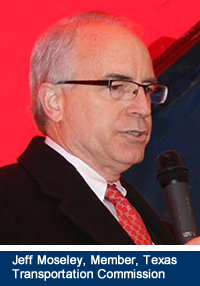 She noted that the total federal and local investment in the channel extension of about $65 million has resulted in plans for more than $13 billion in industrial investment by voestalpine Texas LLC, Cheniere Energy and TPCO America. 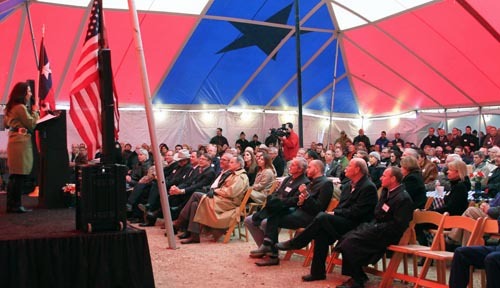 Speakers at the celebration included Texas' former U.S. 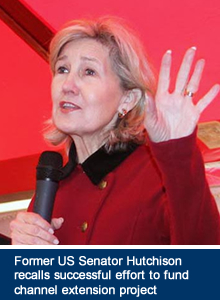 Senator Kay Bailey Hutchison; Texas Transportation Commission member Jeff Moseley; Portland Mayor David Krebs; San Patricio County Judge Terry Simpson; Corpus Christi City Councilman David Loeb; Col. Richard Muraski, Army Corps of Engineers deputy division commander; and Dr. Wolfgang Lakata, voestalpine’s vice chairman. Port Commissioner Barbara Canales served as master of ceremonies. Transportation Commissioner Moseley said the channel extension and deepening is a reminder of the critical economic importance of making infrastructure improvements. He pointed to the value of the state and local partnership that is advancing a project to replace the Corpus Christi Harbor Bridge with a new $700 million bridge and approaches. Judge Simpson expressed his thanks to all the elected and appointed leaders present. He noted that the voters had given each of them the job of developing new jobs and building a stronger economy. Col. Muraski highlighted the environmental restoration projects associated with the channel project including 200 acres of new shallow water habitat and protection of 45 acres of sea grass adjacent to the Ingleside-on-the-Bay shoreline. 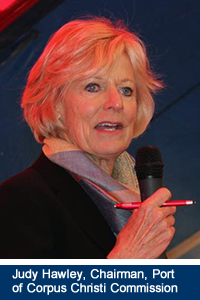 She pointed out that when the first study of La Quinta was authorized in 1990 a completely different set of elected officials were in place at the federal, state and local level including then President George H. W. Bush, Texas Governor Bill Clements and Port Commission Chairman Jimmy Storm. “It lets you know that a project like this is not about one person, it is not about one administration, it is not about one city or one level of government. It is about a whole region, a whole state and the federal government coming together for the right thing. The mission of this port is to serve as a regional economic catalyst. The La Quinta Ship Channel Extension is a sterling example of Mission Accomplished,” she said. Hawley challenged those attending to envision and champion the next infrastructure investment that must be made so that the Port Authority’s customers in South Texas, and all of Texas, continue to thrive and that South Texas continues to attract great companies like voestalpine, Cheniere, TPCO and M&G Resins. “Let’s start envisioning our next La Quinta,” she said to a round of applause. voestalpine expects to start construction soon on a new deepwater dock on the La Quinta Channel extension. Once permitting is complete the company plans construction of a $750 million plant that will convert iron ore pellets into very high purity iron briquettes to be used in making high-quality steel. voestalpine Vice Chairman Lakata told the story of how his company came to select the plant location in South Texas. 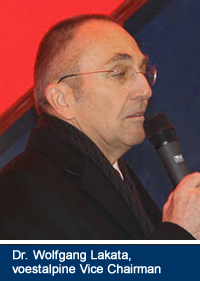 He said the journey stated in 2011 when a team gathered in Austria to environ what iron and steel making could look like in the 21st Century if they started from scratch. The objectives were greater efficiency, lower emissions, smaller footprints and reduced operating costs. 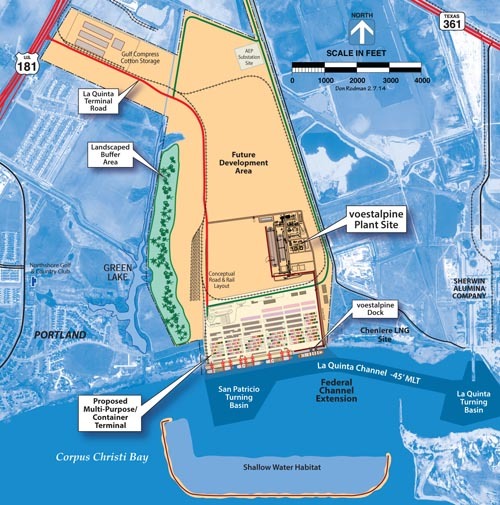 He observed that the Port of Corpus Christi staff could not foresee voestalpine future interest when they were drawing plans for the La Quinta Terminal property in the early 2000s. “The two organizations, separated by thousands of miles, were unaware of each other but were united in one common wish – to establish a new benchmark and leave a legacy our children and grandchildren would be proud of. The benchmark of success combines the right technology, maximum efficiencies and exceptional care of our environment. In January 2012 our paths crossed,” he said. “When we set off on our worldwide search it was a quest for the best location and not necessarily the cheapest. And here in the Coastal Bend we found a most unique combination of excellent conditions and communities that appreciate state of the art industries which are here to stay,” Dr Lakata said. More information about efforts to develop the La Quinta Terminal property in San Patricio County is available in an earlier post HERE.